WASHINGTON-Mom and pop makers of toys and other products for children fear that costly new government regulations could put them out of business soon after Christmas. After recalls of millions of tainted toys from China over the last two years, Congress approved a new law this summer limiting the amount of lead and other chemicals in children’s products. The Consumer Product Safety Improvement Act mandated that, beginning in February, toys, clothes and other products for kids must be tested for those chemicals. The new law covers both products imported by large toy companies and many of those made by craftsmen working from home in the United States. Pam Crowson, a stay-at-home mother of four in Pilot Mountain, N.C., started hand-making hair bows and other products for kids a year ago. She sells them on eBay and Etsy, an online marketplace for handmade products, and makes enough each week to help pay for groceries. While large companies can afford to test materials when making tens of thousands of copies of each product, she said that she makes so few of each item that third-party testing of her fabric – at a few hundred to a few thousand dollars per sample – would be cost prohibitive for her small operation. 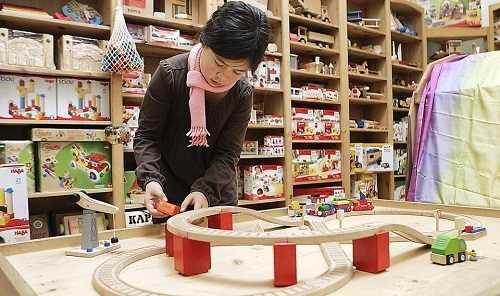 Small-scale makers of toys and other children’s products have organized to lobby the Consumer Product Safety Commission for an exemption to the testing standard. Dan Marshall, owner of Peapods, an independent toy store in St. Paul, Minn. and founder of the Handmade Toy Alliance, said that after the wave of Chinese recalls last year, interest in small-batch, domestically produced toys increased because parents felt they were safer. There are exceptions to the testing rule for crafters making only one unique copy of each item, said Julie Vallese, spokeswoman for the Consumer Product Safety Commission. Small toymakers have inundated the commission with questions and complaints about the new standards, she said. Many are confused about whether the new rules apply to their operations. Consumer safety advocates who fought for stricter lead limits said that they oppose a blanket exemption for small manufacturers of products for kids. “Parents need to know that whether someone is making 10 or 20 of a product or 10 or 20 thousand that the product does not have lead,” and other harmful chemicals, said Nancy Cowles, executive director of Kids in Danger, a consumer safety group. But, she said, there could be room for an exemption for testing some products made from untreated wood or natural fibers that are unlikely to contain lead or other harmful chemicals. Since April, Jacquie Berker of Hillsborough, N.C., has sold handmade children’s clothes, hair accessories and other products from her Web site, Cuckooboo.com. “A lot of people like me are just confused about what actually has to be tested. I couldn’t afford to keep doing this if I had to test each product, it’s really expensive,” she said. Phil Barbato, of Richmond, Va., recently left a full-time job as a Web designer to concentrate on making handcrafted plush monsters, which he sells on Etsy. He and other small-scale stuffed animal makers said they were confused about whether the new law applies to them, and how it could affect their operations. “There’s no way an independent handcrafter could afford to test these things,” he said. Sean Mussenden can be reached at smussenden@mediageneral.com or 202-662-7668.